A contemplation of how art might be valued, how eras might be defined, and how artists survive adversity. Remembering the Artist, Robert De Niro, Sr.
-- Robert De Niro, Jr.
"What was going on in painting at that time, I did not agree with. I saw them all become famous and rich… I could have followed that path, I suppose. But it didn't make any sense to me." Robert De Niro, Sr. reflects on his choices as a painter in an archival interview, the camera close on his face, his teeth crooked and his hair disheveled. For any artist, at any point in time, it's difficult to "make sense" of art, whether their own or art conceived more broadly. De Niro's effort here, in Remembering the Artist, Robert De Niro, Sr., premiering on HBO 9 June, is of a piece with a broader contemplation of how art might be valued, how eras might be defined, and how artists survive adversity. Narrated by his son, Robert De Niro, Jr., this short contemplation is at once deeply personal and intriguingly allusive. That allusiveness begins with the range of interviewees assembled here to remember De Niro, Sr., who died in 1993 of prostate cancer. They include fellow artists and relatives, an art critic and an art historian. Each has a perspective on the work and the man, as much as any might have known him, and each has an idea of what art might mean or make sense. Their memories include the vague (granddaughter Drena De Niro recalls, "He loved Paris, he always had a real thing for Paris") to the potentially complicated (fellow student at the Hans Hofmann School of Art Albert Kresch remembers De Niro's wife, the artist Virginia Admiral: "She was the first one to make it big when we got out"). In between, art advisor Megan Fox Kelly speculates about the artist's multiple paintings of Greta Garbo, specifically in Anna Christie: "There was something about that that really fascinated him," she says of the "melancholy" performance. "It could be that he saw in it a relation to his own struggles with melancholy." De Niro, Jr. offers some similarly general psychologizing about his own interest in the project, suggesting the documentary is part of an effort to secure his father's place in history His self-assessment suggests as well his emotional investment in this ongoing process, involving people who knew De Niro, Sr., as well as those who did not. "The thought of what he's done, all his work, I can't not but make sure that it's held up and remembered," says the son, "So I just want to see him get his due. That's my responsibility and he used to always say that artists are always recognized after they're long gone." It's a project fraught with need and desire, with judgment and ego. It's a puzzle, too, one that can't be solved in one short film. It happens that De Niro, Sr. was recognized during his lifetime, as the focus of "the art scene" shifted from Europe to include people working in the US, especially New York City, following World War II. Early on considered part of the New School of Art, De Niro, Sr. was "discovered" by Peggy Guggenheim and set alongside Mark Rothko, Jackson Pollack, Lee Krasner, and Grace Hartigan. 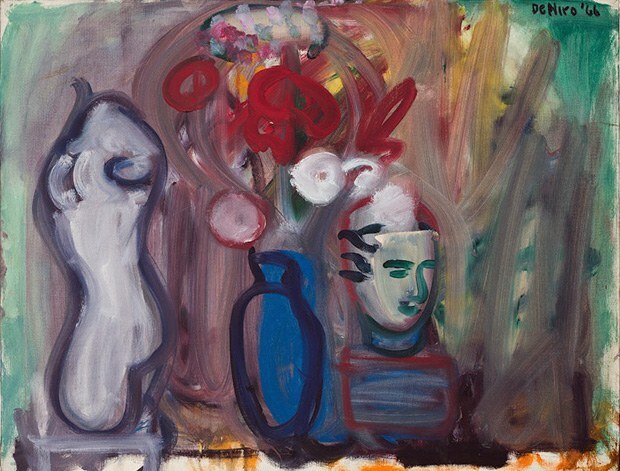 If his work tended to be more figurative than abstract, influenced by Bonnard and Matisse, as Kelly has it, it was admired, particularly in an early New York Times review. In time, he felt left behind, as abstract expressionism and then pop art took hold of the public imagination. The artist's professional struggles coincided with some personal shifts, as he left Admiral and their young son (they divorced, De Niro, Jr. says, when he was 13 or 14, but separated when he was two or three). The son remembers still seeing his father around the neighborhood, on his bicycle, and also going to movies with him. "Was it Beauty and the Beast that was Cocteau? ", he asks, remembering too that he saw Chaplin movies and King Kong with his father too. As the son suggests these adventures were influential, he also adds another note, that his father's homosexuality might have had something to do with the divorce and also their father-son relationship. While his parents remained friends, De Niro, Jr. says, his father seemed isolated. He reads from his father's journals, as these might provide some insight into his father's personal and professional struggles, insights his father didn't share when he was alive. "Maybe his sexuality," De Niro, Jr. offers. "I don't know where that stood at that point.," a reticence that may have had to do with his father's sense of "guilt." 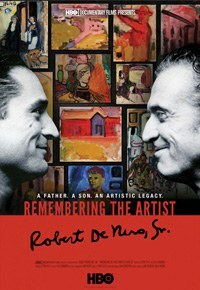 As difficult as the subject might have been for the father to discuss with his son, and as difficult as it may be for his son now to detail in public, the film maintains a sort of respectful distance, leaving most of the artist's self-representation to his paintings, his enduring engagements with the world. However this "guilt" might be working, across time and sensibilities, the film offers occasions to ponder the complexities yourself. These moments are the movie's most resonant and least simple, exemplified when a combination of De Niro, Jr. reading from the journals and Philip Glass' piano score, accompanies examples of his father's work, crucifixions and pink figures, women and men, seated and faceless. If his father was proud of him, as the actor's career took off, the two men also lived separate lives; De Niro, Jr. suspects his father felt some concern that it was the son making the name famous, not him. Still, De Niro, Sr. resisted changing his style or even his thinking about his art to accommodate trends. "Being a painter is an affection, like being a homosexual," De Niro, Jr. reads. "One has to have the strength to continue working without the thought of recognition either before or after death, just as one had to have the have the strength to accept life alone without the thought of a romantic attachment." The art of this language and the poetry of these images are lovely and poignant. As much as you might try to "make sense" of them, you might also understand something about this man's several means of self-expression, his legacy after all.